"She's trying to prove that she's closer to my children than I am. But the joke is on her because she doesn't know how little I care for Gob. I have never felt more aware of my own inattentiveness than when I blew through the stellar first season of Arrested Development and I wondered how exactly I missed the series in its first go round. Here is a show that may well be the next great American sit-com and so few seem even to know it exists. Recently, after six Emmy wins and two different time slots, the series was renewed and moved to Monday nights, where the latest ratings show it losing to every other series it runs against. Sadly, this innovative half-hour of programming falls behind the ratings champ, Wife Swap, and it is enough to make you shake your head in disgust. Still, we should all thank our lucky stars that we even have Arrested Development after two ratings-challenged seasons in which we've had the opportunity to know and be strangely drawn in by the Bluth family. 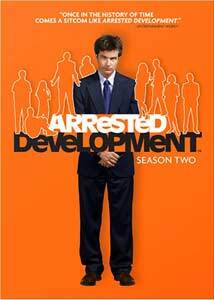 Here, we join their disfunctual family as the dust settles from the debut season in which George Sr. (Tambor) was arrested by the SEC for defrauding investors and possibly some light treason, sending the family into hysterics with Michael (Bateman) standing alone in at least some sort of reality. Throughout the course of the second season, oldest son GOB (Arnett) briefly becomes the figurehead of the family business in an effort to keep the feds from prosecuting Michael in George Sr.'s absence. While Buster (Hale) is enlisted into the army by a spiteful Lucille (Walters), George Sr.'s twin Oscar (also Tambor) has stepped in to replace his brother in Lucille's life. Daughter Lindsay (Rossi) and her husband Tobias (Cross) continue their separation as Tobias becomes an understudy for the Blue Man Group and Lindsay tries desperately to get any man's attention, from the bounty hunter hired to find her father to her daughter's crush, Steve Holt (Wade). I would place Arrested Development near the top of the list of the funniest comedies ever to air on television as the writing is so good it is staggering. The humor is both intelligent and broad, and with the perfect cast, even the most subtle gag manages to be laugh-out-loud funny. The writers also manage to weave running jokes from one episode to the next, sometimes to much announcement and other times passively in the background. The best, and most sublime, is the appearance of blue paint throughout the house after Tobias has taken his job with The Blue Man Group. Shot in a hand-held pseudo-documentary style with no laugh track, the show benefits from this distinctive style—while playing less like a sit-com, the series looks and feels more filmlike, too. The proceedings have an improvisational air in the same vein of the equally brilliant Curb Your Enthusiasm, and there are often times where the central joke is built upon by a sly response that improves upon the joke rather than dwarfing it. The most striking thing about the second season is that aside from one minor stumble in Ready, Aim, Marry Me in which Martin Short manages to be unfunny, it manages to build in quality until the finale. The writers even go so far as to give the narrator (Howard) his own plotline in which he loudly criticized the narration of a made-for-TV film about the Bluth family in Spring Breakout. Like in its debut season, Arrested Development manages to land some of the biggest guest stars around. From Zach Braff as the creator of the popular Girls With Low Self Esteem who manages to embarrass GOB while angering Lindsay, or Ben Stiller as magician Tony Wonder, GOB's rival. Favorites from Season One also return, as Carl Weathers, Julia Louis-Dreyfuss, Liza Minelli, Henry Winkler, and Judy Greer each reprise their roles on more than one occasion. For as good as the guest stars are, Bateman and company have managed to become the best ensemble on television today. Bateman's dry delivery and condescending style seem perfectly suited to Michael, while Walters and Arnett manage to steal nearly every scene with their biting dialogue. There isn't just a weak link in the cast. Image Transfer Review: The 1.78:1 anamorphic widescreen transfers for Arrested Development are generally well done with strong sharpness and detail and only some slight video noise in a handful of episodes. Colors are rendered well in deep and rich tones, while there is no excessive grain to be found. Audio Transfer Review: The Dolby Surround channel is typical for a television comedy with deep and rich dialogue from the center speaker while the left and right speakers add a small amount of ambience. Extras Review: Commentary is provided by creator Mitchell Hurwitz, Michael Cera, Will Arnett, Jessica Walter, Alia Shawkat, Tony Hale, and David Cross for the episodes Ready, Aim, Marry Me, Good Grief, and The Righteous Brothers. Each track manages to be terrifically entertaining as the group talks about the filming of the second season and the storylines, and offer several behind-the-scenes anecdotes. There are times where the participants seem to blend into one another, but the tracks are worth a listen. A brief recap of the first season can be found in Season One in Three Minutes, which provides a good primer for those who need to be brought up to speed. A collection of deleted and extended scenes are offered for each episode and many are simply extensions or alternate takes, though some manage to be as funny as anything that can be found in the episodes. A brief blooper reel as well as the complete campaign videos seen in Immaculate Election are also available. For my money, Arrested Development manages to be among the best comedies on television right now, if not ever. It may take some time for new viewers to become accustom to the style of the show, but those who take the time to get to know the Bluth family will be well rewarded.